Career and technical education (CTE) is the practice of teaching specific career skills to students in middle school, high school, and post-secondary institutions. On this page, we’ll take an in-depth look at each CTE cluster to understand what’s included and why they’re important. We’ll also update this page as updates to CTE come out so you always know what’s going on with career and technical education. First, here is a video with some information about CTE and why you may have been hearing the term so much lately. Next, let’s take a look at a graphic overview of CTE. Infographic: What Is Career & Technical Education? This infographic is designed to give you a quick visual reference of every CTE track available. Next, let’s take a look at the literal definition of CTE. We’ll explore our own definition of CTE that we supplied at the top of the page. Career and technical education (CTE) is the practice of teaching skills-based careers to students in middle school, high school, and post-secondary institutions. At AES, we believe this is the most accurate definition of CTE because it highlights CTE’s unique qualities and why it’s important. First, CTE is focused on skills. This differs from traditional and university-based education, which is based on theory. CTE includes some theory, but that’s typically only seen in introductory materials. Practice, hands-on experience, and application tests make up the bulk of CTE. This is important because CTE careers require workers to have experience in their field before starting a career. After all, many CTE tracks take students to careers that can save lives. Health science, government, law, agriculture, and construction especially relate to others’ health and safety. Because of that, CTE instructors often focus more on practice and improvement instead of textbook memorization. Second, CTE is applicable to almost every educational age range. This is because students can understand fundamentals of any career as early as sixth grade, and they can build essential skills well into adulthood. That’s why you’ll find CTE tracks offered in middle schools, high schools, and post-secondary institutions. Then, students can earn the certifications they need to start their careers, many of which are currently in high demand (like nursing). At the same time, CTE tracks don’t limit students to single careers. In fact, many students use these courses as preparation before moving onto community college or university. Typically, these qualities are at opposite ends of the education spectrum. A teaching method is either general and versatile or specific and inflexible. With CTE, students get the best of both worlds. Now, let’s delve into the 16 career clusters CTE offers to students. The 16 career tracks of CTE are distinct, specialized areas of expertise in high-demand occupations. Some tracks are more in-demand than others. Plus, tracks become more or less popular as the economy and culture of an area change as well. On top of that, CTE tracks change based on new breakthroughs, best practices, and other advancements. 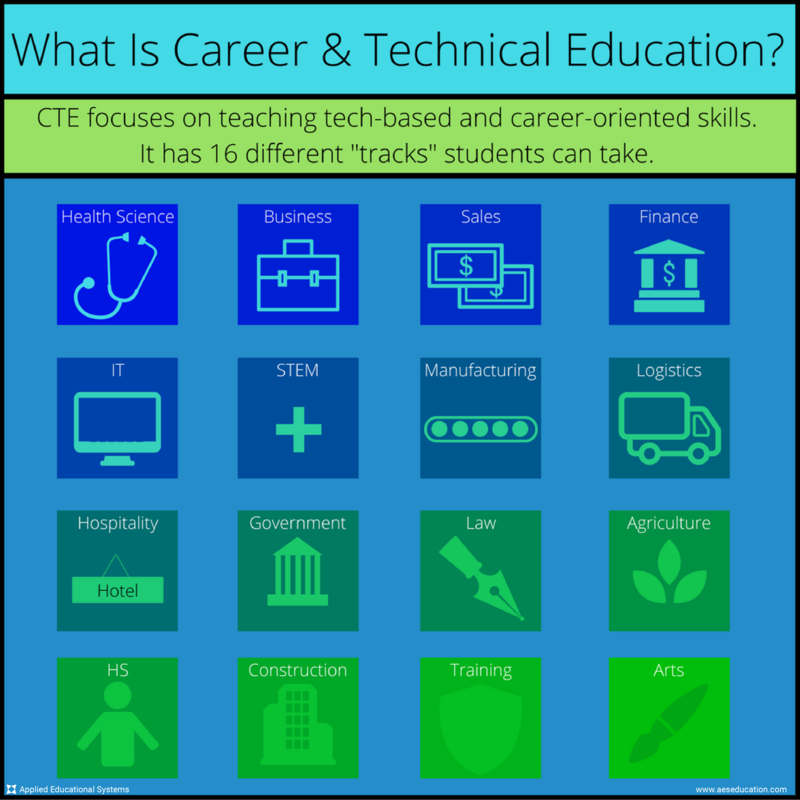 In other words, the 16 CTE tracks are rich, expansive career opportunities that allow students to explore what they love. They provide an alternative to traditional education, though it’s also common for CTE graduates to continue their education at four-year universities and even pursue advanced degrees. Altogether, this means CTE’s career tracks teach students life skills and career skills at the same time, jump-starting their lives and turning them into productive members of their communities. But this is just an overview. To get a better idea of CTE’s 16 career tracks, let’s take a look at each one individually. Health science is one of the most popular CTE career tracks today. As a result, today’s health science students have golden opportunities to start lucrative careers as nurses, patient care technicians, and more. This is important because it shows students that they don’t need to go through a decade of post-secondary education to help others. Health science students can start saving and improving lives of patients the day after they earn their appropriate certifications. Most of these certifications go through the National Healthcareer Association (NHA), which has become one of a handful of distinguished healthcare certifiers. Full disclosure: AES created and actively maintains an online curriculum for health science called HealthCenter21. It’s been used in a variety of areas and for a variety of purposes throughout the United States. Mainly, it supports CTE teachers who don’t have formal training in education, but they’re experts in their fields. HealthCenter21 has course templates, lesson plans, teaching modules, and other helpful resources that simplify the teaching process. That means CTE teachers can help their students without spending hours of their free time creating a custom syllabus. Health science is just the beginning though. CTE offers more than a dozen other high-demand career tracks. Business is one of the most commonly-taught courses in CTE because of its versatility. A background in business prepares CTE students with a leg-up in almost every career path, especially management. While CTE doesn’t delve into business as deeply as a Bachelor’s or Master’s degree, it provides the foundational knowledge someone needs to help businesses grow — or even start a business of their own! Business is also an area where CTE students can earn certifications to prove their knowledge. This isn’t as common as certifications in health science, but they’re still valuable additions to any student’s resume. Regardless of a company’s industry or customer demographic, it can always benefit from professionals who know how to make corporations function. That’s the value in the CTE business career track. Full disclosure: AES created and currently maintains an online business curriculum for CTE teachers called Business&ITCenter21. We’ve had teachers tell us they use Business&ITCenter21 for tons of different reasons, but they all come back to prepping students for real-world careers. In fact, Busines&ITCenter21 has an entire career readiness curriculum that’s designed to catapult students from the classroom to the office. That helps teachers get their students ready for their first major career move. Plus, it lets teachers save time in terms of planning, grading, follow-up, and more. In a nutshell, Business&ITCenter21 makes students and teachers succeed. Marketing, sales, and service are all based on the concepts of customer acquisition and customer retention. They deal with different parts of the customer experience, but they’re all essential in keeping a company viable. Marketing kicks off the customer experience by turning curious parties into sales leads. Sales takes that lead and works with them to turn them into a paying customer. Service (sometimes called customer success) makes sure that customer stays happy and sticks with the company for as long as possible. In that respect, every company needs employees who represent each of these three areas. CTE preps students for the basics in each of these specialties and helps them combine their skills to form a successful customer experience. The finance CTE track teaches students how to handle large-scale bookkeeping, accounting, and more. It gives students a strong foundation in understanding cash, revenue, expenditures, profit margins, and more. This is the ideal scenario for someone making their first steps into the financial world, whether that’s with an accounting firm or working a company’s accounts receivable. It’s worth noting that most finance students will probably need a more advanced degree as they work their way up the corporate ladder. This is because finance is a highly-competitive field. If a CTE student has dreams of moving to Wall Street or a similar high-competition environment, they’ll need additional diplomas and certifications. This isn’t necessary for every finance student though. In fact, CTE finance graduates can earn a fine living with nothing more than their graduation certificate and industry certifications. The biggest challenge in finance is that it’s constantly changing. The industry can turn on a dime (no pun intended), and applicable laws change with the tides. But if a student has the endurance and drive to keep up with these changes, a CTE background gives them everything they need to succeed. Information technology (IT) is the application of digital networking, information transfer, server reliability, and other 21st Century essentials. CTE students who choose the IT track will learn everything they need to bring whole companies online in terms of local servers, equipment maintenance, and networking setup. Plus, IT graduates walk straight into one of the most lucrative and high-demand job markets in the world. Once a student has their IT certification, they can start a career anywhere from local businesses to Google. This career is becoming increasingly important as more businesses switch to Internet- and cloud-based business models that require greater degrees of reliability. With that in mind, the combination of CTE and on-the-job training can make any IT graduate grow from entry-level work to chief information officer in a matter of years. Science, technology, engineering, and mathematics (STEM) is one of the hottest occupational topics in America, covering everything from shop class to vehicle design. STEM is so popular for the same reason as health science — there are a lot of STEM-related careers, but very few people to fill them. As a result, CTE STEM graduates have golden opportunities to earn high salaries with low levels of competition from other STEM graduates. In other words, there are plenty of STEM opportunities to go around. STEM graduates can move into machinery, computer applications, and even high-level engineering — especially if they pursue advanced degrees after their time in CTE. The sky is the limit for STEM students, and the world needs their expertise. Manufacturing in CTE covers all of the processes, materials, and protocols that are commonly found in mass production. While manufacturing isn’t a large part of the US economy in the 21st Century, it’s still a major track in CTE. That’s because smaller companies — especially in states like Pennsylvania — still maintain manufacturing facilities for the sake of boasting that their products are made in the United States. Even if a CTE student can’t get into a grassroots manufacturing company, it’s still a valuable field for all the companies that outsource inventory production. So even though manufacturing isn’t quite as big in the US anymore, CTE students can still launch successful careers in manufacturing. Transportation, distribution, & logistics deals with the foundation of the world economy — moving and tracking inventory from Point A to Point B. Logistics is a notoriously detailed industry that requires someone with a keen eye for organization. That’s difficult to find in today’s job market. Fortunately, that means CTE students who specialize in logistics have plenty of career opportunities in almost every area of the United States. Trucking, shipping, and storage all fall under the umbrella of this CTE specialty. As a result, any company that needs to track inventory will always need transportation, distribution, & logistics specialists. During CTE, these students get hands-on experience with tracking systems, identification technologies, and scheduling practices to ensure companies can run smoothly. Tracking systems are especially important, and some students may even spend time with radio frequency identification (RFID) practices and back-end systems management. But on the whole, these CTE graduates work to keep the trains (and trucks) running on time. Hospitality & tourism shows CTE students how to manage businesses like hotels, motels, inns, bed-and-breakfasts, and tourist attractions. This is especially valuable in states like Florida, California, or Colorado that draw swarms of tourists on a regular basis. This CTE track covers virtually everything a student needs to know about turning seasonal visitors into a viable, long-term industry. CTE graduates may not go on to run a hotel right off the bat, but they can at least get the relevant experience that complements their education. Then, they can get hands-on experience with hospitality management, including all of the business and industry principles that go along with that. This is CTE track is especially valuable for any students who plan to stay in the areas in which they were born, acting as a native resource for outside visitors to their town. Government & public administration covers the current setup of governments, how citizens interact with governments, and how governments maintain order. Typically, that means CTE students learn about local governments. Taxes, parks, budgeting, councils — these locally-oriented governmental issues all require someone with background knowledge. That’s the kind of information CTE students learn when they start the government track. This career path can earn a lot of money for students, but it can also bring a lot of stress. The stress comes from the fact that many government positions — including those at the local level — are elected positions. That means students with higher aspirations about working in local government will also need to participate in politics and popularity contests. While the government CTE track may not tell students how to market themselves to get the most votes, it will launch them into government work in general. Law, public safety, & security focuses on emergency services and all legal-based occupations. In general, law is well-known as a profitable career path. While that’s not a great reason for someone to learn law in the first place, it’s a definite motivator for CTE students who want to work as paralegals or legal bookkeepers. On top of that, this career path is a great start for students who want to branch into criminal justice, particularly law enforcement. They may require a Bachelor’s degree in some police jurisdictions, but a CTE background at least gives a student a head start on pursuing their dreams. At the very least, CTE gives students the chance to work in other capacities of legal occupations, including clerical work. That’s an excellent starting place for anyone looking to get more involved in law, and it pays well enough to keep additional education on the table. But even if a student doesn’t want to pursue further education, they still have lots of options at their fingertips by following the CTE track for law, public safety, & security. Agriculture, food, & natural resources teaches CTE students about how human life is sustained around the world. This allows graduates to pursue a wide range of careers, as agriculture is an enormous field. These students can go on to become farmers themselves — but that’s only the most obvious career. They can also work as inspectors, lab technicians, administrators, and researchers. Depending on the work environment a CTE student enjoys, they can really do anything their heart desires with an agriculture background. Do they want to work outside? There’s plenty of hands-on, clear-skies work that needs done around the United States. Do they prefer the indoors? Laboratories constantly test different parts of agriculture — like soil and building emissions — for compliance. The wide-ranging field of agriculture is a great choice for any CTE student. It may not be for everyone, but it’s a solid career path. Human services refers to careers that focus on the needs of individual people. Typically, these needs revolve around some element that’s lacking in a person’s life. Social work, social services, and drug rehabilitation all fall under this umbrella. In some states, this CTE background may also apply to special education. Students follow this track when they have a burning passion to help people emotionally. This differs slightly from health science, which is more based on helping people physically. Unfortunately, human services careers frequently pay less than careers in other CTE tracks. This could be for any number of reasons, but it also ensures students follow this path because they want to — not because they want the salary. That concept acts as a double-edged sword. But it’s hard to find students more passionate about what they do (and who they help) than in the human services track. Architecture & construction CTE students study the principles of designing and crafting structures. While a graduate from this track isn’t immediately qualified to become an architect, they are qualified to work at an architect office or construction company. They may want to get their hands dirty and build structures or stay at a desk and help design them — that’s up to them. But they’ll be prepared for either possibility with a CTE background. Still, a student following architecture & construction may decide they want to work in a completely different capacity. That’s when they can look into becoming construction inspectors, project estimators, and other careers. At the end of the day, the United States is expanding in almost every city. Architecture & construction specialists are in demand every day because someone has to design and build the cities of tomorrow. With a CTE background, students can get in on the ground floor of that excitement. Education & training turns CTE students into experts in the learning process, empowering them to teach others just as well as they’ve been taught. While this isn’t enough to become a teacher in most states, a CTE background in education still makes someone a prime candidate for careers in training and recruitment. That could be anything from on-the-job training to consulting. A student on this career track can find just as much opportunity in a small business as a multinational corporation — wherever workplace standards are in place. As a result, this track is vague. But it’s also broad. Students in this track can take this knowledge virtually anywhere in the world and it’ll still apply. By learning training and educational principles, they can become excellent teachers — even if they’re teaching new hires at a company. Arts, audio-visual technology, & communications focuses on the technology that helps create today’s entertainment. While this could mean drawing, painting, or composing for some students, this CTE track is more concerned with operating the technology that makes those products possible. That’s why so many of these students go on to audio engineering, lighting technology, and similar careers. Those skills make these students right at home in any large venue, including stadiums. Then again, they could also enjoy the privacy of working freelance for local charities. In a nutshell, there’s always someone who needs technicians with these skills. Theatre, speeches, concerts, rallies — they all need audio-visual technicians of some kind. With this background, students are always ready to answer the call. Now that we’ve covered all 16 CTE career tracks, let’s check out where CTE is often taught. CTE is mostly taught in post-secondary institutions that focus on hands-on experience and career skills. However, CTE has also recently become popular in high schools and middle schools. In fact, some students can now choose a career path in CTE as early as ninth grade! The only barrier is what their school can provide. It’s difficult to find a school that offers all 16 career paths. Post-secondary institutions, high schools, and middle schools often offer health science as the first pathway. This is because health care has such a high demand right now as an industry. As the American population ages into retirement, more health professionals will have to accommodate their needs. That means schools that currently offer health science are training students who’ll really come into prominence in a decade or so — right around the time they’re needed most. Many schools also offer business classes since the track is so versatile. Any business student can apply those skills to almost any industry, customer demographic, or area. The other CTE tracks may also be present in different schools, but they’ll depend more on that school’s location. For example, it wouldn’t be a great fit for a school in Manhattan to offer the agriculture career track. Fortunately, enough schools in the US now offer CTE that it should be easy for any student to find a place where they can learn what they want. So how does CTE differ when it’s taught in different schools? CTE in middle school is taught as an elective. Students choose whether they want to follow it, unless they attend one of the few schools in the country that requires one of the career tracks in their curricula. At AES, we actually have a few teachers who use HealthCenter21 at the middle school level. Tyler Page of Brantley County Middle School has seen some great success with it. Other CTE options are great for middle school as well, especially computer applications. There’s also career readiness. It’s not strictly CTE, but it’s still helpful for young students. Middle school is just the beginning, though. CTE is much more common in high schools. CTE in high school is also taught as an elective, but courses are often offered in greater variety. It’s also common for high schools to offer certifications in CTE tracks like business and health. In fact, AES has several high school customers that use Business&ITCenter21 to teach their students the fundamentals. Many of these high schools use our product to prepare students for certifications, and others choose to use it as supplemental material. That’s how many CTE classes work at the high school level. Instructors are generally experienced in their field — they just need teaching resources like Business&ITCenter21. CTE in post-secondary institutions typically includes complete tracks that end in certification or graduation. Many of these students go straight from the institution to starting their careers. The career tracks at post-secondary institutions take students from introduction to employment straight through. They may also have the chance to get first-hand experience with different tools, scenarios, or principles through internships. On the flip side, CTE institutions also tend to cost more money than taking the same classes in high school or middle school. Some institutions are also for-profit colleges, which have a poor reputation for quality. Still, taking CTE courses from an institution is a viable option for pursuing a technical education. In fact, it’s common for many students right out of high school, whether they’re starting their education from scratch or continuing what they learned in high school. So now that we’ve looked at where CTE is taught, let’s consider how it’s taught. CTE is taught in a lot of different ways, but it works best when used with blended learning. In fact, our products HealthCenter21 and Business&ITCenter21 are both designed for blended learning environments. Our HealthCenter21 teachers use the product differently, but they frequently all share one factor in common. They don’t teach with one method for a full class period. As a result, several of our teachers have been able to achieve 100% certification rates with health care exams. We’ve found a similar trend with Business&ITCenter21 teachers. With a blended approach, some of these teachers have also achieved 100% certification rates for Microsoft Office Specialist. In a nutshell, blended learning works in CTE. And AES is here to help. At AES, we have multiple CTE programs you can use to teach. All of them are online, and all of them come with a whole suite of features. Check out our program page to learn more!